The electric consumption is lower up to 80% respect conventional systems. For instance just 240 watt are necessary to produce 60 lit/h. 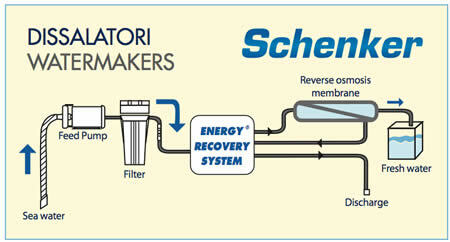 A Schenker watermaker doesn't need to have either the engine or generator running when making water. Thanks to this high efficiency, Schenker watermakers can be powered even directly from service batteries, without the need for a generator. Thanks to the low electric consumption the CO2 emissions necessary for making water are lower than 85%. Schenker watermaker allows to produce water and consider the environment. Working simplicity. Thanks to the automatic pressure regulation there are no valves to regulate or operations to carry out. All at the flick of a switch. Schenker watermakers don’t make use of high pressure pumps. The result is a very quiet running and vibration free. The parts of the watermaker in contact with sea water are mainly made with carbon fibre or acetylic resin.The watermaker is totally corrosion free then. Lifetime. The internal seals of the new 2.0 systems, are made with special frictions bands produced with nanotechnology. This material exhibits a very low friction coefficient, and an incredible resistance to abrasion, up to 15 times greater than carbon steel! Schenker watermakers, as an alternative to the high pressure pumps of traditional systems make use of a new device (Energy Recovery System) that amplifies the pressure supplied by low pressure pumps and recover most of the spent energy. This enables very high energy efficiency. The typical specific electric consumption is 4 Watth/lit only.